Poetry: The Art of Interpretation – is designed to teach students how to interpret, appreciate, and analyse poetry. There are 9 complete lessons (estimated to last approximately 60 minutes), therefore 2 weeks of lessons. This complete, no prep unit is a great way to start! 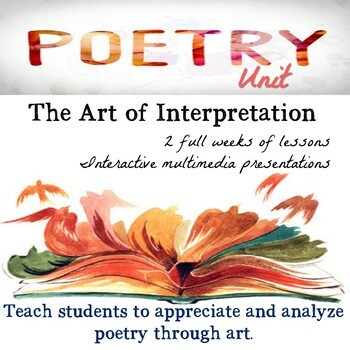 This unit includes a student guide, 9 detailed lesson plans, 2 multimedia presentations (no internet connection required), a detailed answer key with annotated poems and answers, and an end of the unit evaluation with rubric, and answer key. This unit incorporates art to help students understand and appreciate the beauty within words. In addition, students will learn how to analyse themes in poetry though paintings and art work. The unit includes a student packet (20 pages), a teacher packet (with 9 complete lessons), and a comprehensive answer key with annotations to poem (with 17 pages). See preview for more details. The unit has been created in such a way as to simplify the teacher’s life. Photocopy the 3 packages included and don’t worry about it for the rest of the unit. You literally can begin teaching it without any other preparation.